The Riva 1920 stand at the Milan Furniture Show is showing off a unique a wooden sculpture reproducing in full scale the award-winning Cambiano concept car presented by Pininfarina at last month's Geneva Motor Show. The Milan Furniture Show model is made out of the wood of the briccole, the posts of European oak used to mark the navigation channels in the Venice lagoon, which were also used on the original Cambiano concept car (above) for the floor and the entire low part of the cabin. The 2012 edition of the Salone Internazionale del Mobile (Milan Furniture Show) is playing host to an array of new Pininfarina-signed designs. The company’s historic cooperation with Snaidero has generated the new Idea 40 kitchen. For Calligaris, Pininfarina has designed the new Alyon modular divan. The Prima bathroom line is the result of a new cooperation agreement with BluForm. 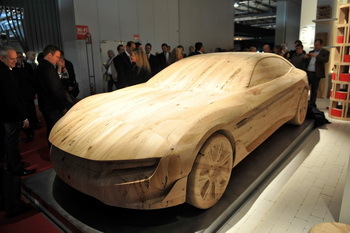 And there had to be some reference to the world of cars: in fact the Riva 1920 stand is showing a wooden sculpture reproducing in full scale the Cambiano concept car presented by Pininfarina at the recent Geneva Motor Show. 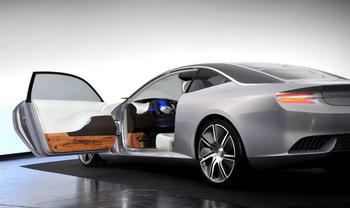 After being elected “the most beautiful concept car of 2012 Geneva Motor Show” and ready for the upcoming Asia-Pacific debut at the Beijing Motor Show, the Cambiano by Pininfarina becomes a sculpture entirely done in Venice briccola wood showing a full scale reproduction of the lines and volumes of the concept car. A new project born out of cooperation between Pininfarina, Riva, the SCM Group and Licom System, displayed starting from today at the most important furniture and interior design Show. The wood of the briccole, the posts of European oak used to mark the navigation channels in the Venice lagoon, was also used on the original concept car for the floor and the entire low part of the cabin. Riva1920, a historical Italian producer of solid wood furniture that has been working with Pininfarina Extra for over ten years, had the idea of recuperating the wood of these 12 metre poles, thousands of which are replaced every year. The wood is marked by the lagoon water and by marine microorganisms, which come alive again, creating a new manufacturing that is destined to last. Following the same principle, Riva1920 has created all the wooden elements for the interior of the Cambiano, using numerical control milling machine followed by manual final polishing and oiling. The result is surprising and evocative. The material is about to embark on its third lease of life, and it reveals its unique texture and the wear and tear of passing time: the holes made by the marine molluscs are still visible on the surface. Not only. This complex, technological craftsmanship makes the interior of the Cambiano something unique that expresses an outstanding level of creativity and experience, thanks to this eco-friendly re-use of a natural, discarded material with the enormous evocative force of the huge cultural, emotional and artistic dimension attributed to Venice all over the world.